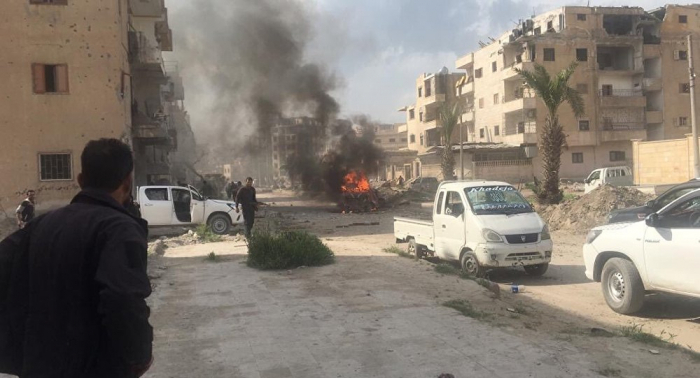 At least one car bomb exploded in Raqqa in northern Syria on Tuesday, according to local media reports. Local news sources said a mine exploded, followed by two car bombs that left several dead, including women and children. Other local Arab portals said at least four died in the explosion. There has been a steady increase in attacks on areas controlled by the U.S.-backed Syrian Democratic Forces (SDF) that are mainly east of the Euphrates River. The U.S.-backed group led by the PKK terrorist group's Syrian affiliate the People's Protection Units (YPG) has warned that Daesh militants would intensify an insurgency after their territorial defeat in their last enclave in Syria. SDF launched attacks against Daesh's last enclave at Baghouz near the Iraqi border in March. Turkey is strongly opposed to the U.S.' partnership with terrorist YPG and SDF, saying partnering with one terrorist group to defeat another will not achieve the desired goal. The YPG is the Syrian affiliate of the PKK, which is listed as a terrorist group by Turkey, the U.S. and the EU. In its 30-year terrorist campaign, the PKK has taken some 40,000 lives, including women and children.